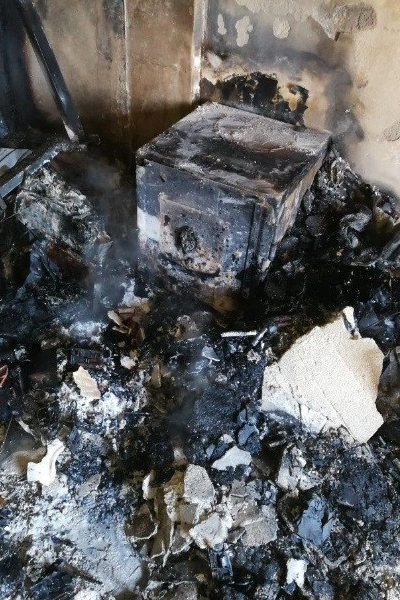 Kaso often open safes damaged in building fires around the world. Recently a Kaso safe was opened that had suffered in the forest fires in Greece. The house was burnt down to the stone wall. Opening is always a thrilling and emotional event as the state of the contents cannot be guaranteed, especially if the conditions have exceeded what the safe is designed to withstand. The particular safe model was tested to withstand a heat of over 1000 degrees for one hour, but according to the owner, the safe had been at least four to five hours in temperatures above 700 degrees. This time the result made everyone and especially the owner very happy: the owner was delighted with the good condition of the stationery and keepsakes.